An intimate musical which exposes the souls of three strong women who reflect the promise of the future, while revealing the pain of the present and their regrets of the past. A smoldering family drama inspired by Chekhov's Russian masterpiece and set at the height of the civil rights and anti-war movements of 1969. 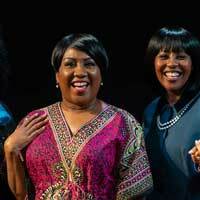 "...MetroStage continues its winning 2018/19 season with the company's fourth production of Three Sistahs. This musical premiered in 2002 and it's easy to understand why it is one of Producing Artistic Director Carolyn Griffin's favorites." "...MetroStage's Three Sistahs is a marvelous musical, an evening of vocal and dramatic excellence. Written and directed by Thomas W. Jones II - with a story by Janet Pryce - and music by William Hubbard, this show features three amazing actresses, Roz White, Kara-Tameika Watkins, and Ayana Reed telling the story of the Bradshaw sisters' lives in the aftermath of their oldest brother's death in the Vietnam War." "...Get ready to raise the roof. Then stomp your feet and clap and shout amen. This show grabs you by the throat with raw emotion and music that will lift you to a better place for two hours." "...Three Sistahs as a work gets its foundational strength from the collaboration and no- holds-barred experience of a female perspective (Idea for the book by Janet Pryce) plus male perspective (the work is written by Thomas W. Jones II.) Pryce knew to mine the dramatic relationships of a family of sisters and hone the conflict of Anton Chekhov's Russian drama Three Sisters. Jones knew instinctively to "dress" that inspiration in the 1960's, driving the story with a fluid text and choreographic style of the then popular girl-group trios with their tight harmonies, synchronized gestures, and carefully manicured personas."